These true diversity, in-ear monitoring products from Wisycom have been designed as professional level systems for use in TV, broadcast, film and live music events, however their ease of use opens them up to many more applications. The MTK952 is a 1U rackmount, dual transmitter with DSP audio processing that covers a wide 328MHz bandwidth, tuneable in steps of 5kHz. Up to 2400 user-defined frequency allocations can be made within forty groups of sixty frequencies. 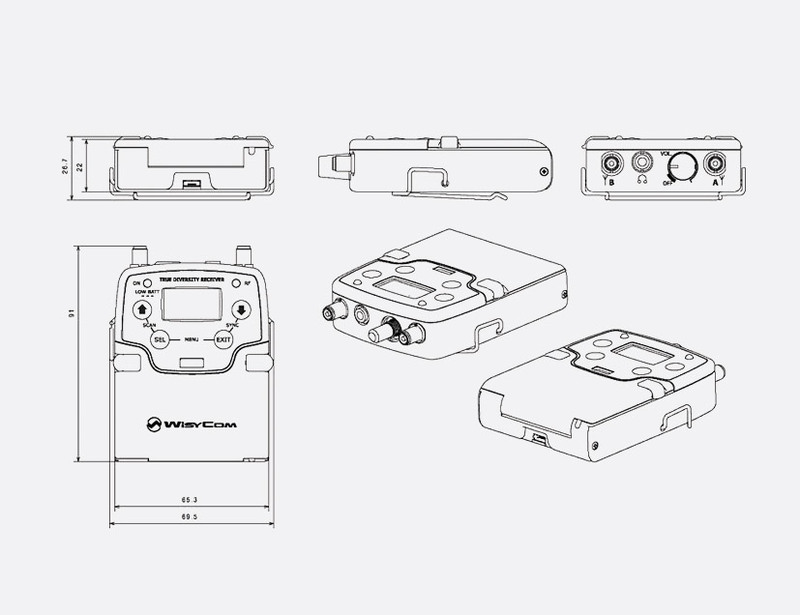 Each of the two internal transmitters have AES/EBU XLR input connections for digital audio, and dual balanced XLR/6.3mm jack combination sockets for analogue audio inputs. 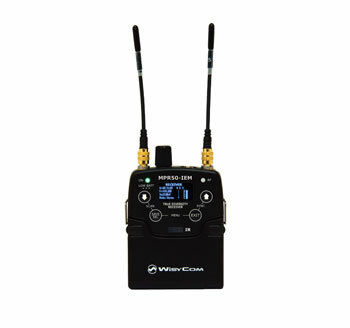 Balanced 6.3mm jack loop outputs enable the user to use the transmitter in a chain, preserving the audio input qualities. An RJ45 Ethernet port can be used to connect the transmitter to a network or external computer. The front panel features all of main editing functionality in easy reach with each channel presenting 9-stage LED bars for L/R input audio level and RF modulation. Two 64 x 256 pixel yellow OLED displays, one for each transmitter channel, show user-customisable information such as channel, group, TV channel, AF input level, TSQ on/off and network. Three touch buttons and a rotary push-to-select button give access to an intuitive menu and setting options. A 6.35mm jack headphone monitor output is positioned to the right of the front panel of the unit along with channel 1 and 2 selection buttons and headphone volume control. The front panel also features TX1 and TX2 lock/unlock button and global power on/off switch. An internal EQ gives access to edit bass, 40/80/160Hz; middle, 1.5/2.2/2.8kHz; and treble, 5/7/10kHz, frequencies with a -12/+12 gain control in 1dB steps, and a selectable Q of 0.7, 1.0, or 2.0. From the 'Mode' menu, the user can also adjust the HP filter and LP filters. Frequency response: 20Hz-20kHz, mono; 30Hz-15kHz, stereo. Monitor out: 6.35mm balanced jack socket, 120+120mW at 24ohms, 80+80mW at 150ohms. Power supply: 90-264V AC, 50/60Hz; 10-16V DC, maximum 7A (with DC option). Dimensions (w x d x h): 483 x 407 x 43.8mm, with brackets. Weight: 3.8kg. 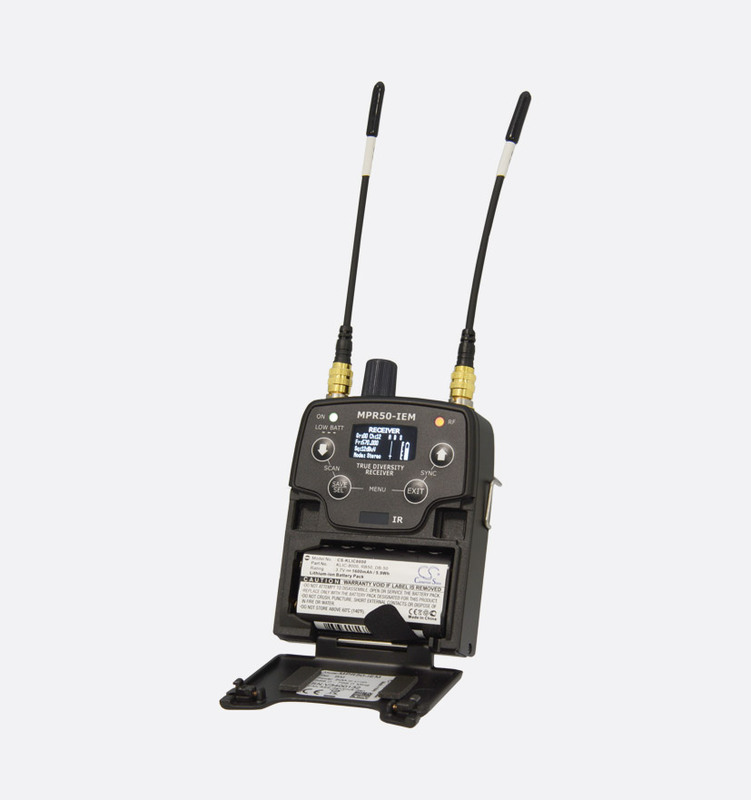 This compact, true diversity, bodypack receiver has a wide-band tuning range from 470MHz to 700Mhz (Band N). The output stage has been designed to give a maximum peak audio output of 200mW and terminates on locking 3.5mm TRS jack. Four front facing buttons aid navigation through the menus on the 128 x 64 pixel white OLED display that also shows AF, RF, frequency set, channel, and stereo (with MPD decoding) or mono mode. Infrared and automatic scan can be used for quick setup. Frequency response: 30Hz-5kHz, +/- 0.5dB. Distortion: 0.3% typical. Stereo separation: Better than 60dB. Powering: 2x AA alkaline or rechargeable batteries. Battery life: 4hrs, alkaline; 6hrs, lithium. Dimensions (w x d x h): 69.3 x 22 x 91mm, without clip. Weight: 100g, without batteries.